The National Park Service Inventory and Monitoring Program is producing geologic base maps for approximately 270 National Parks. Our team is focusing on the geomorphology of coastal parks. This project addresses the action of the earth-forming processes on the deposition, mobilization, and subsequent accumulation of sediments to produce the resulting geomorphological characteristics in the coastal parks we are examining. Furthermore, these processes continue to influence the development the landscape and, as a result, these maps will serve to identify a stage in the evolution of the geomorphology. Many of the geomorphological features incorporated on these maps were affected by processes associated with Hurricane Sandy in October 2012. A new series of geomorphological maps representing post-Sandy conditions is being prepared. 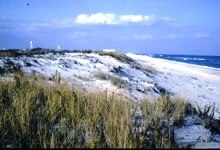 We are mapping Gateway National Recreation Area, Fire Island National Seashore, Assateague Island National Seashore, Sagamore Hill National Historic Site, William Floyd Estate, and the New York Harbor Parks. An example of a geomorphological map of Sandy Hook within Gateway National Recreation Area, created using spatial datasets from 2010. An example of a geomorphological map of the Sailors Haven area within Fire Island National Seashore, created using spatial datasets from 2011.